Award winning writer and director Martin McDonagh’s ‘The Lonesome West’, directed by Julie Kelleher comes to the Everyman Palace Theatre in Cork. It is the third part of his Leenane Trilogy and was first performed by Druid in 1997. It portrays the murderous and shocking happenings in a fictional town located in the West Of Ireland. 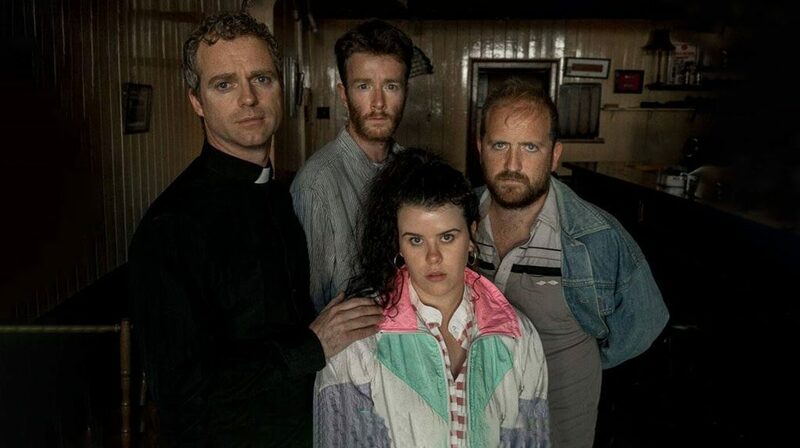 A black comedy with explosive moments starring Gus McDonagh as Coleman Connor, John McCarthy as Valene Connor, Andrew Holden as Father Welsh and Amy McElhatton as Girleen Kelleher. It tells a story of two constantly feuding brothers; Coleman and Valene, whose father has just died due to a shotgun incident. Father Walsh, the despairing local alcoholic priest attempts to civilize the two with the help of a Poitín selling schoolgirl, Girleen. Normally, a death of a parent is a tragic event, however, no remorse is conveyed. Coleman is only interested in attending funerals to get free vol-au-vents and Valene is only interested in Poitín and his figurines. John and Gus put on a great display of comedic entertainment and well choreographed fighting scenes. The phrasing and timing are crucial and are handled well by both brothers. John’s portrayal of Valene’s mannerisms and compulsive behaviour is very convincing. Father Welsh and Girleen’s scene in the second half slows down the pace of the play, nonetheless, it was a confident and beautiful display of warmth and kind-heartedness that exists in life, which is a complete contrast to the squabbling siblings. All the characters’ shenanigans are so uniquely Irish. So much so, if you have a sibling you may be able to identify with Valene and Coleman at different points throughout the performance. Two highlights of the play, firstly the sequence of apologies between Coleman and Valeen. The idea of the apology is to put all disputes behind them and move forward in a civil manner. Both brother’s attempts require a discussion that does not erupt into violence and is communicated in a very funny way. Secondly, when a gun is drawn over the disfigurement of some of Valene’s most loved items. All of the stage was used, the set is full of symbolism with lighting that suited the play beautifully. If you’re looking for a night full of dark comedy ‘The Lonesome West’ is sure to give you some laughs.